If there is one place where you’ll surely find coriander seeds, it’s in your granny’s kitchen spice box! Coriander seeds are the dried berries of the coriander plant, whose scientific name is Coriandrum sativum. It is small, hollow-stemmed, and belongs to the Apiaceae family that includes carrot, celery, and parsley. Coriander is known to have first grown in Southeastern Europe, but has spread to other parts Europe as well as the Middle East, Turkey, China, and India. The coriander plant usually grows to a height of two feet and has tender, hairless two- or three-lobed dark green leaves. When the plant is mature, it grows small, blush-colored flowers that later turn into spherical or oval-shaped fruits (seeds). The seeds are tiny, usually four to six millimeters in diameter, and have a central empty cavity that contains two vertical resin canals. The right time to harvest the coriander seeds is when the plant becomes brown, and its leaves dry up and fall. Harvesters cut the crop, tie them in small bundles, and leave them to dry under the sun for a few days. The sheaves are then beaten with a stick to separate the coriander seeds. Another method is to use a lightweight roller to wear out the pods. What Do Coriander Seeds Taste Like? Coriander seeds’ taste is subtle and pleasant. Unlike fresh coriander, sometimes called cilantro, the seed has a mild lemony, soil-like flavor that works best when you throw in other spices, especially chili pepper and cumin. Coriander seeds can be used in their whole form or ground into a fine powder that has a typical yellowish-brown color. Toasting the seeds before grinding them brings out their flavors and oil aroma. Dried coriander seeds are used whole and powdered all over the world today. They are mainly used as an aromatic spice in the cuisines of places like the Mediterranean, Latin America, the Middle East, and South and East Asia. Coriander seeds are used to add flavor to food items like stews, sausages, confectionery, cakes, and sweetbreads. You will find coriander seeds in “Borodinsky bread,” a Russian dark rye bread, and “açorda,” a Portuguese bread soup. It is also used to make rice dishes, meat rubs, and pickled vegetables. India is a place where ground coriander seeds are preferred and used for making chutneys, curries, and marinades. Mexico has taken to coriander seeds in a big way, and locals use them to make delectable dishes like posole, enchiladas, salsa, and guacamole. Don’t get flustered about how to select coriander seeds! It’s easy to do a quality check on coriander seeds before you buy them. Just squeeze them between your index finger and thumb and see if they release a nice, mildly peppery flavor. If they do, they are ripe for the picking. It is better to buy whole seeds rather than the powder because the powder may be adulterated. The right way to store coriander seeds at home is to put them in airtight containers and place them in a dry, cool, and dark spot. They will last for several months, and when you need them, you can always grind them into a fine powder using a hand mill. Make sure you use the powder as early as possible because it loses its flavor quickly as its essential oils evaporate. Coriander seeds contain unsaturated fats, which are good for heart health. They have vitamin C and a variety of minerals such as calcium, magnesium, phosphorus, potassium, and sodium, which should be a part of any healthy diet. They also have carbohydrates, protein, and dietary fiber in healthy quantities. In a 2008 study published in the Journal of Environmental Biology, researchers fed animals already on a high-fat diet coriander seeds to observe the potential cholesterol-lowering properties. The animals showed significantly lower cholesterol and triglyceride levels and excreted larger amounts of liver bile acids and neutral sterols in their stools, when compared to a control group. The seeds supply vital ingredients like oleic acid, linoleic acid, stearic acid, palmitic acid, and ascorbic acid, which can reduce the level of LDL or “bad” cholesterol in our body. LDL cholesterol is considered harmful because it gets deposited in the inner walls of the blood arteries and restricts blood flow. Therefore, coriander seeds can help in preventing the occurrence of several cardiovascular problems like heart attacks and strokes, and atherosclerosis. An added benefit of coriander seeds is that they increase the HDL or “good” cholesterol in our body. A study published in the Asian Pacific Journal of Tropical Medicine in 2018 examined rabbits that were injected with a toxin called carbon tetrachloride, producing liver toxicity in them. After being administered coriander seeds- and coriander leaves-based sauces, it was found that the levels of toxicity in the rabbits were reduced. The study concluded that consuming coriander seeds and leaves could protect humans against liver-kidney toxicity induced by various xenobiotics. Thus eating coriander seeds may help the body in fighting against chemical poisoning of the liver and kidneys. According to a 2009 study done on diabetic rats, published in Phytotherapy Research, a coriander seed extract aided insulin activity, which was essential to lowering the glucose levels in the animals’ blood. The extract decreased blood glucose in the rats and increased insulin release from the beta cells of the pancreas. This lowers the incidence of sudden spikes in blood sugar levels so that other normal metabolic functions happen as usual. Drinking coriander water regularly may help protect against diabetes. It’s made by soaking 10 grams of crushed coriander seeds in 10 parts of water overnight. If you have digestive problems, coriander seeds may provide relief with their unique ability to calm inflammation. So, if you’re experiencing flatulence, bloating, or other symptoms of a disturbed digestive system, try having a coriander seed smoothie with coconut milk, ice, cucumber, and a tablespoon of coriander seeds to ease your symptoms. This may also improve nutrient absorption in your intestines. Coriander seeds contain essential vitamins like folic acid, vitamin A, and beta-carotene, which give added protection against the common cold and flu. The seeds are a particularly good source of vitamin C, an antioxidant that supports the cells of the immune system. According to the USDA, 100 grams of coriander seed powder has almost 30% of the recommended daily intake of vitamin C.
People who suffer from high blood pressure may benefit from regularly consuming coriander seeds as well. Excessively high blood pressure increases tension in the blood vessels. Coriander is a catalyst for the interaction of calcium ions and the neurotransmitter cholinergic, or acetylcholine. This chemical interaction relaxes the tense blood vessels and prevents the incidence of heart attacks and strokes, which are often fatal. Melt the butter over medium to high heat in a regular-sized saucepan. Add the broccoli stems and saute for eight minutes until they turn light brown. Keep basting regularly by pouring the butter over the stems. Add the fresh coriander seeds, flowers, and stems and keep basting for three more minutes. Slice each stem crosswise into 1/4-inch-thick, coin-shaped rounds. Apply and spread a good amount of roasted garlic on each broccoli coin. Drape the coins with prosciutto so that it heats over the broccoli. Sprinkle the dried coriander seeds, coriander leaves, and cracked pepper. Then add a squirt of lemon juice. Your dish is ready to serve. Preheat the oven to 450 degrees F and coat a baking sheet (rimmed) with a thin layer of vegetable oil. In a large bowl, drizzle the potatoes with olive oil and toss in coriander seeds and thyme. Blend well. Transfer the potatoes to the oiled baking sheet and spread them in a single layer. Sprinkle with salt and pepper. Put the fries in the top third of the oven. Bake for around 40 minutes, until they turn golden in color. Turn with a spatula about halfway through cooking time. Season with salt as per taste, and your dish is ready to serve. Are Cilantro & Coriander the Same? Whether cilantro and coriander are the same or two different things depends on your location. In some countries, they mean the same, but are different items in other countries. The Latin name of the herb is Coriandrum sativum, which explains the origin of the name coriander. Cilantro, on the other hand, is the Spanish translation of the word coriander. The dried berries of the coriander plant (Coriandrum sativum) are known as coriander seeds. Even though the coriander plant was first cultivated in along the Mediterranean coastline of Europe, it is now available in many parts of the world. 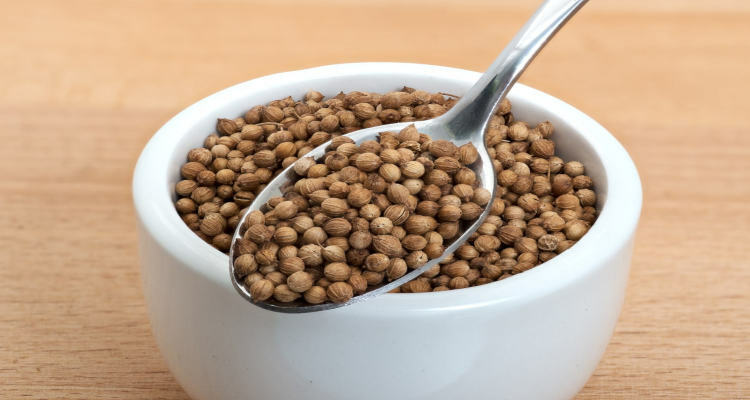 Coriander seeds, both in their whole form and as a powder, are used to spice up foods in places like Iberian peninsula, Russia, Turkey, India, and China. Coriander seeds have many health benefits to offer, as research suggests they can help maintain cholesterol levels, prevent food poisoning and liver toxicity, and manage diabetes. Due to their nutrient content, they could potentially improve digestion, regulate your blood pressure, and boost your immune system to fight colds and flu. You can use coriander seeds to enhance the taste of your dishes and pleasantly surprise your family and friends by preparing delicious items like baked fries with coriander seeds, and broccoli with prosciutto and fresh coriander seeds. Coriander seeds may be small in size but are big on taste. Use them regularly and see the quality of your dishes (and possibly your health) go several notches higher! https://www.nutrition-and-you.com/coriander-seeds.html, last accessed November 23, 2018.
https://www.bbc.com/food/coriander_seeds, last accessed November 23, 2018.
https://www.thekitchn.com/inside-the-spice-cabinet-coriander-105794 last accessed November 23, 2018. Raman, R., “Cilantro vs Coriander: What’s the Difference?” health line, February 22, 2018; https://www.healthline.com/nutrition/cilantro-vs-coriander, last accessed November 23, 2018.
https://nutritiondata.self.com/facts/spices-and-herbs/183/2, last accessed November 23, 2018.
http://jeb.co.in/journal_issues/200801_jan08/paper_08.pdf, last accessed November 23, 2018.
http://www.apjtm.org/article.asp?issn=1995-7645;year=2018;volume=11;issue=3;spage=209;epage=213;aulast=Iqbal, last accessed November 23, 2018. Eidi, M., et al., “Effect of coriander seed (Coriandrum sativum L.) ethanol extract on insulin release from pancreatic beta cells in streptozotocin-induced diabetic rats,” Phytotherpay Research, Mar. 2009; 23(3):404-6; https://www.ncbi.nlm.nih.gov/pubmed/19003941, last accessed November 23, 2018. Curejoy Editorial, “8 Proven Health Benefits Of Coriander Seeds,” Cure Joy, April 9, 2018; https://www.curejoy.com/content/health-benefits-of-coriander-seeds/, last accessed November 23, 2018.
https://www.stylecraze.com/articles/amazing-benefits-of-coriander-seeds/#gref, last accessed November 23, 2018.
https://ndb.nal.usda.gov/ndb/foods/show/263?fgcd=&manu=&lfacet=&format=&count=&max=35&offset=&sort=&qlookup=coriander+seeds, last accessed November 23, 2018.
https://www.lybrate.com/topic/coriander-dhaniya-benefits-and-side-effects, last accessed November 23, 2018.
https://www.foodandwine.com/recipes/broccoli-stems-lardo-fresh-coriander-seeds, last accessed November 23, 2018.
https://www.bonappetit.com/recipe/oven-fries-with-coriander-seeds, last accessed November 23, 2018. Hamilton, G.N., “Coriander and Cilantro: What’s the Difference?” Delishably, June 7, 2018; https://delishably.com/spices-seasonings/coriander-cilantro, last accessed November 23, 2018.